There’s that one main room in your home where everyone gathers, perhaps watches TV, enjoys lively conversations, plays games. You might call it the living room or the family room. You might even have a great room, a modern version with an open floor plan that also combines the dining room. We love building great rooms for our clients, which by its very nature, encourages family interaction. Regardless of what it’s called, this is the heart of your home, and you want it to be a room that shines. Your living room should, more than any other room, reflect the personality of you and your family. Here are some tips to help bring some love into your living room or make that great room even better! - If you have a great room, then you must rely on area rugs and furniture to create the spatial boundaries in the room. Typically, you want a backdrop that is more neutral. Different sections of the space can utilize colors and patterns but should compliment the other sections of the room. Accent walls can also be used to cleverly add definition between spaces. - Update your great room with a home office space, small library, children’s play corner or adult arts and crafts corner. All of these options can, again, add dimension and definition to the space. - Find some unique antiques to add some character to your living room. Old antique doors can also be used to divide up a room. We recommend a hidden gem right here in San Antonio, called Architectural Antiques Salvage. This giant warehouse is filled with all sorts of treasures, from doors to light fixtures, clawfoot bathtubs, sinks and even some décor. They are located at 403 Dawson St., just on the eastside of downtown. - If you’re looking to update your furniture, which is a fun way to change the look of your living room, consider adding some curved furnishings. Once popular in the 60’s, the curved look is coming back. For example, a crimson velveteen sofa with a back in the shape of a half circle and a curved cushion in front. A piece like this can help add a touch of femininity to the room. - Light fixtures can be an easy way to define the space in your great room or living room, and can also serve as a showpiece that truly represents the ambiance you’re wanting to achieve. 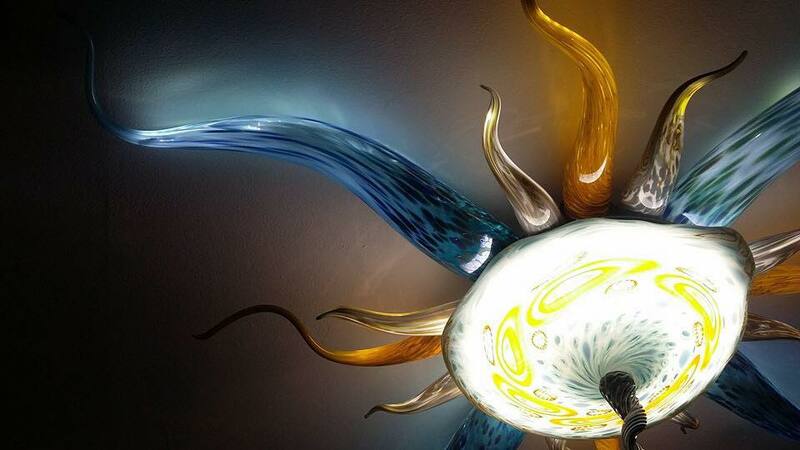 You might consider having some custom blown glass pieces to create a modern-day chandelier. Locally, we recommend Glen Andrews Art Glass of Caliente Hot Glass. They can design a piece specific to your look and tastes and even install it for you. For more information, visit glenandrewsartglass.com. However, if it’s simply time to start dreaming of a new great room, we’re here to help! Give us a call at 210-494-5400 or fill out our online form to get started.